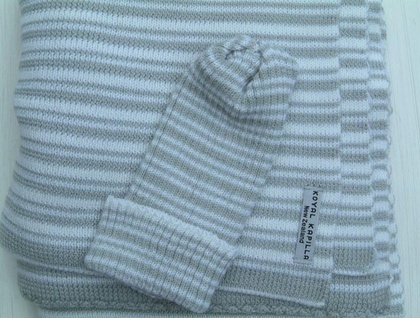 Designer knitwear for babies by Koyal Kapilla New Zealand. All needle large cot blanket in Super Soft Fine Wool striped with 100% fine Stone Merino. Exremely Soft, warm luscious fibres with a lovely handle. Being a knitted all needle rib blanket it is extremely stretchy to tuck you baby in comfortably & snuggly. ESPECIALLY DESIGNED to use in bassinetts & cots or as a large blanket throw as they grow into toddlers. Fine MERINO & "SUPER SOFT FINE" fibres are best for babies / toddlers. The fibres are smoother,it does not irritate baby's delicate skin. Not to mention that it is exteremely WARM, Soft & stretchy as a knitted blanket. Being a natrual fibre it breaths and helps maintain baby's temperature without over heating them or making them cold. Koyal Kapilla New Zealand is designed & knitted inhouse in Auckland. Yarns used are sourced from local suppliers as well as from Europe. Any questions and feedback is most welcome. .Thank You.